Tea infused into everyday foods. A kettle whistles, releasing a plume of steam. Hot water swirls over a wire mesh basket, plumping whole tea leaves, unleashing their aroma as steam rises from the teacup. The ritual of tea begins anew. Scratch that—all of it. Forget what you think you know about tea. We’re pulling the doilies out from under the teapots. 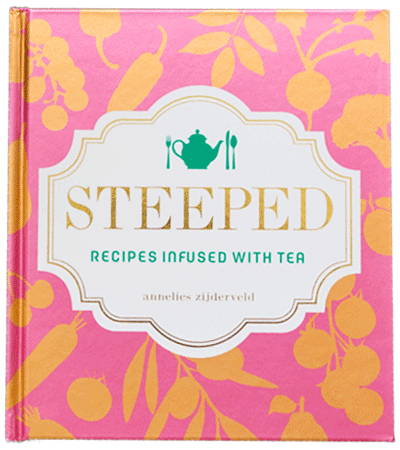 Steeped: Recipes Infused with Tea* encourages experimenting with tea in cooking and baking as another flavor in a cook’s culinary color box. Invite tea into every meal of the day through 70 plant-based recipes. Get steeped. *Named one of the Los Angeles Times’ favorite cookbooks of 2015. If interested in purchasing Steeped for your store or library, please contact the publisher, Andrews McMeel. What is the recipe on page 64 of Steeped?